Tali climbed this against my advice and had a very scary descent! There seems to be a common perception that kids need to learn to do things 'just because they have to'. People tell me there are lots of things we do just because we have to, like cooking food, math practice, driving safely, paying taxes, etc. This is how I make every choice. I look at my circumstances and figure out what course of action will serve me best, and proceed. What better skill to teach my children than to make wise choices! Forcing them to do things 'because they have to' is only telling them that they have no choices, and then when the time comes for them to be responsible adults, who will they turn to, to make their choices for them? But what if they fall? What if they fail? What if they're hurt... or worse? Of course we don't want them to make unwise choices and run into problems. But how will they learn if they are never given freedom to explore? I give my children plenty of advice, but they don't always follow it. And I keep open arms and a good first aid kit around for when their choices don't work out the way they hope they will. The likelihood is that my children will fall. They will fail. And they will hurt. I try to minimize the hazards, but in the end the pain will teach them to make better choices the next time. There will be no 'just because you have to', and in its place there will be wisdom. As registered year-round homelearners, our kids get certain student rates, and we often have to explain why we still use these discounts during the summer, when most kids aren't in school. Today, as I was requesting our discount, a clerk said "oh, summer school, eh?" To which I replied, "no, we're just unschoolers". "Well, yes, we're registered as homelearners, but in practice we're unschooling." I prepared for the usual sarcasm, bewilderment and/or disbelief. Instead, the woman looked me in the eyes and said exactly this: "Unschooling? I've never heard of that. So it's like learning by experience or something?" I smiled, and said. "Yes. Exactly." Of course she had the usual worries and fears about learning math and getting into university, but within less than a minute of conversation she was enthusiastically nodding her head and grinning. What a wonderful day! I love meeting people with open minds!! Every summer we go camping with our local Nature Club at some off-island site. This year the camp was at a little lake in the mountains, and after a couple days of hiking, swimming, kayaking and visiting with friends, we also stopped for a play in the river on the way home. Uncle and Auntie waiting for us at the ferry terminal. Dusty roads following them up the pass. Tali and Uncle's early morning kayak. Moose footprints by a high mountain stream! Lower coastal river. Such beautiful soft fine sand! Perfect sculpture and play sand!! 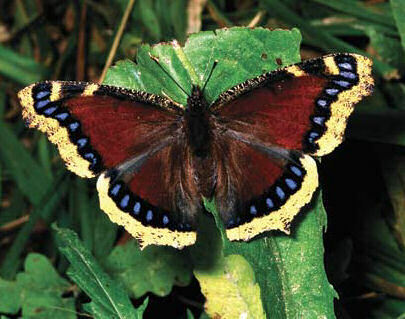 Or... Raising Indigenous Butterfly Larvae. So we put some in a jar with some of the young shoots from the aspen. After consuming about half of them, they attached themselves to the underside of the jar's lid, rim, and the branches inside, and began to form chrysalises. Here is one of the caterpillars just newly hanging upside down, with a completed chrysalis. And then... happily on a day we were teaching a Wild Art Camp, the first butterfly emerged! We did see it take flight, but were not prepared to take photos as it ably fluttered up into the bare aspen branches. 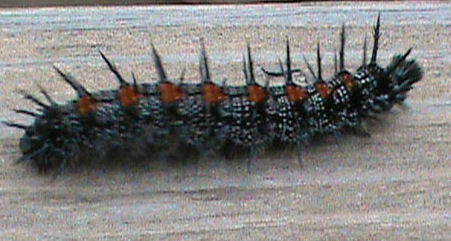 So here is a photo from Encyclopedia Britannica... this is what our caterpillar became! Our sweet dog, Hazel Parachute Piccolino, came to live with us when she was a baby, in October of 2009. We got Hazel in 2009, as I posted on our other blog. I've written many times about her life, and today I will write about her death, and why and how it happened. As her first year progressed, we discovered that Hazel had two problems: her allergies to all animal proteins and to grass. Animal proteins are everywhere. Even though we fed her a vegan diet and tried to keep her away from them, she still managed to get them on a fairly frequent basis. Grass is everywhere, too, and basically unavoidable. We even tried getting rid of grass from behind our house and planting a clover lawn for her... but the grass crept in faster than the clover could grow. Grass gave her a rash and inflammation on her feet and face. She chewed it until it bled. Animal protein made her ears and intestines swell up and get infected. So her first couple of years were a yo-yo game of various medicines, trying to mitigate all the horrible reactions and infections. She was always in pain. Then we found a vet who would put her on a constant dose of Prednisone, which kept the reactions and subsequent infections at bay for a year. She had one pretty good year. Then last January the side-effects of the Prednisone started to catch up with her. She'd been losing her hair for some time already, but her liver was getting enlarged, and she started getting crusts on her skin. Without going into all the details of the many things we've tried and the effects of them, suffice it for me to say that she has been in agony most of the last 6 months. She has spent countless nights jumping at the side of our bed, crying in pain, and we've never been able to take that pain away. By the end of June, he liver was having problems, she had an untreatable skin infection and was losing her skin to gaping wounds at an alarming rate, and her muscles were wasting away before our eyes. The antibiotics made her nauseous and she was even more dopey from an increased dosage of Prednisone. What used to be small happy walks for her became the cause of great pain and inability for the next two days. She had so many oozing sores and goopy creams on her that sometimes we shrunk away from snuggling her, which was basically all she wanted. Then in the last few days, she often didn't want to be touched anymore, but just to lay beside us. She finally stopped finishing her food in the last couple of days, and we were forced to accept the vet's suggestion that putting her down might be the kindest thing to do. On the day before we put her down, she was spitting out the pills Rhiannon was trying to feed her... as usual. Then she came over and lay her head in my lap, looking into my eyes plaintively, as she's been doing most of every day these past couple of months. Rhiannon handed me the pills, and I thought I'd have to open her mouth and put them in, as I often do. But I looked at her, first. I said, "Hazel, you're going to die, tomorrow. There will be no more pain, then. But these pills will keep the pain from getting worse while we wait for tomorrow." She lifted her head and ate the pills off my hand. That night we let her chew an antler. It didn't matter anymore, and she could have whatever she wanted. Yesterday we all went out to dig a deep hole for her in the forest by our house. She lay beside us, watching. She lay on my lap in her favourite floppy-dog position while Tali and Rhiannon lined the bottom of the deep pit with ferns. Then we went in to town together, fed her chicken (joy! ), and let her do whatever she wanted at the beach. She snarfled some seaweed, walked a bit in the ocean, and lay her head in our laps, some more. She had a big poop. Tali found a feather and wove it into my braid, as we were leaving the beach. Then we went to the vet. He was kind and gentle, and gave us as much time as we needed. She went still in our arms, and we brought her home in the back of the car she's been in so many times. My father and I carried her from the car to her grave, where Markus stood, to lift her in. As I bent over to pass her into his arms, the feather Tali had put in my hair fell out and onto Hazel's soft fur. My parents' elderly dog, Tiel, who has been Hazel's best friend since she came to live with us, came and looked at the open grave. We put Hazel's favourite ball in, and the antler she'd been enjoying. My mother put in the ball that Tiel had surrendered to Hazel. The children picked flowers and dropped them on top of her. Then the children, Markus and I buried her with the dirt of the home she's known most of her life -- the dirt she used to roll in so happily. Four years is an incredibly short life. We weren't ready to lose Hazel, at all. But Hazel was ready to go, and that was ours to accept. There will be a hole in our home for some time, and we don't know if we'll ever have another dog. But while Hazel was with us, she brought us unconditional love, and a whole lot of learning. And for one good year, she was happy.